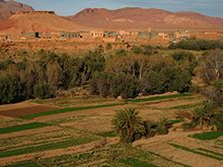 Morocco i s one of the best places in the world for fossils and one of the best places in Morocco is the Kem Kem Basin, Khouribga. Especially for aquatic fossils, The Kem Kem basin is a massive bone bed made up of mineral phosphates (usually derived from bone) and it is the largest phosphorite bed known in the world. 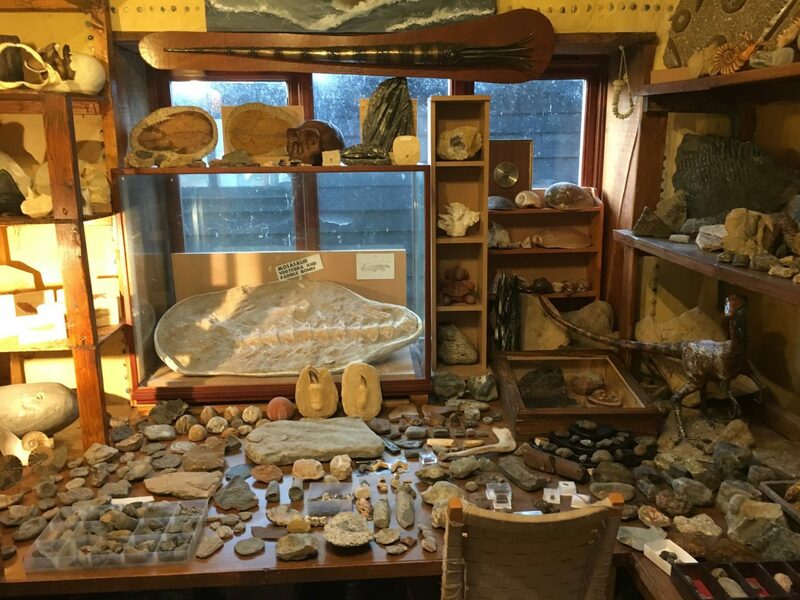 One palaeontologist described the fossils in it as, “Hundreds of times more abundant than a normal marine sediment” (italics mine) 1.
far more than could ever exist in a normal present day environment 2. 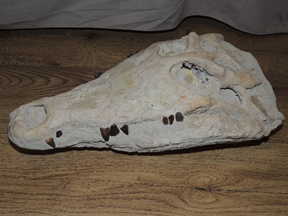 Among the millions of fossils found there, one crocodile skull has been excavated, and made its way to us at the Genesis Museum of Creation near Norwich UK. There are several things that this crocodile skull can teach us. First, look at how well preserved the skull is. Crocodile teeth do not have roots in them, as the photo of the modern crocodile tooth shows. Their teeth are designed to fall out really easily. A crocodile is always growing new teeth to replace old, worn-out ones. The new teeth grow in at the base of the old teeth, pushing the old teeth out of the jaw. To have a crocodile skull so well preserved when the large teeth are still present, is quite remarkable. This means that it took 500 years for a single centimetre of sediment to be laid down, so our crocodile which has a skull 40cm (16in) long, and over 15cm (6in) high, would have taken over 7,500 years to just cover it, let alone bury it deep enough to fossilise it. This is absolutely ridiculous if you think about it. So what can we take away from this? First, although the assumptions of evolution and deposition of sediment over millions of years are all well and good in the universities and textbooks, they do not make sense in the real world, in fact, they are ludicrous to even consider. Secondly, the Bible’s account of a world –wide catastrophic flood7 fits with the evidence that we see in the rocks around us. The Bible teaches that God created the world in six days, and that the whole world was good. But man disobeyed God, and chose to be his own god. As a result of this rebellion, man has lived in sin from that time forward, and is destined for eternal punishment from God. But in His Great love and mercy, God provided a way for us to escape the coming judgment. He sent His only son Jesus to die on a cross, and to take the place of punishment for our sin. Jesus paid the price, and is giving it to you today as a free gift, however as with any gift that you are given, you have to be willing to receive it. Accept Jesus as your Saviour today, and be free of all your guilt and sin! 1, 3 Sharks of the Moroccan Phosphates – Dr Charlie Underwood, Deposits Magazine, Issue 17, Winter 2009, p8 & 9. 2 Genesis 7:21 – And all flesh died that moved upon the face of the Earth, both of fowl, and of cattle, and of beast, and of every creeping thing that creeps upon the earth, and every man. 4 Castle Museum, Norwich, Animal Gallery, Creatures of the Past display. 5 A large crocodile-like marine reptile, reaching over 50ft long. Previous Previous post: Fossil teddy bear!?!? Genesis Museum of Creation Research Buried Alive!! Crocodiles found in phosphate give evidence to the Biblical Flood.